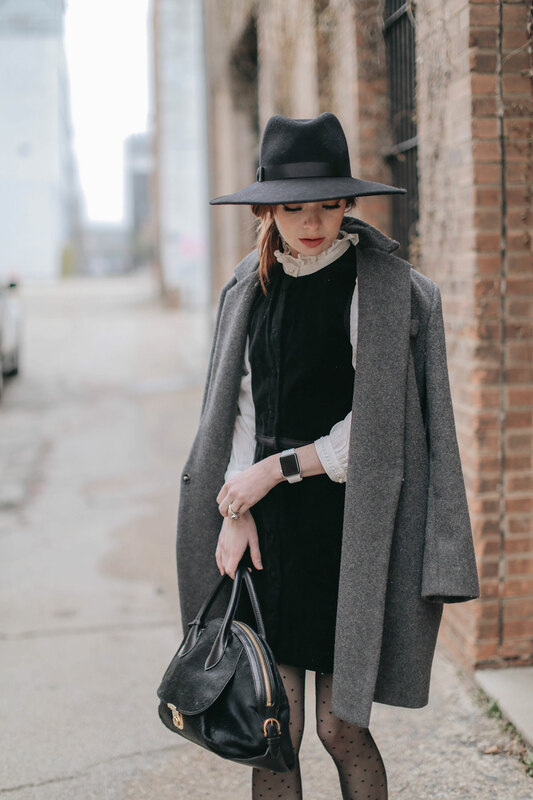 I don’t often dress in all neutrals but days on end of dreary weather can put me in the mood for grays and blacks. I wore this yesterday on a very foggy afternoon. I am trying to appreciate winter while it lasts, I know that I will be missing the opportunities to wear my favorite coats and boots. I got this adorable dress at & Other Storie when I was in Paris last month. I am already getting my wear out of it! Wearing a vintage coat, & Other Stories black velvet dress with mock shirt, Marsell boots from several years ago, and Ferragamo Fiama bag. Absolutely love it! Love ???? the black & velvet shades, that deep black colour coat look! … Very cozy and vintage look! ???? You’re so sweet! Thank you so much. I love the look! The tights and ruffle collar make it more fun! this look is amazing, babe! Great ensemble! Perfection! Love your boots, too. What a great hat! I love foggy DFW Days, as well???? It’s so rare when they last past 9 or 10am. We had so much fun shooting. This is a really great dress, nice cut and great details . Lovely shots Jane . I was going to say, this is a very “grey” look for you! But sometimes, the weather really can affect our sartorial choices. ESPECIALLY if you live in a grey & bleak country lol I.E Scotland like me! 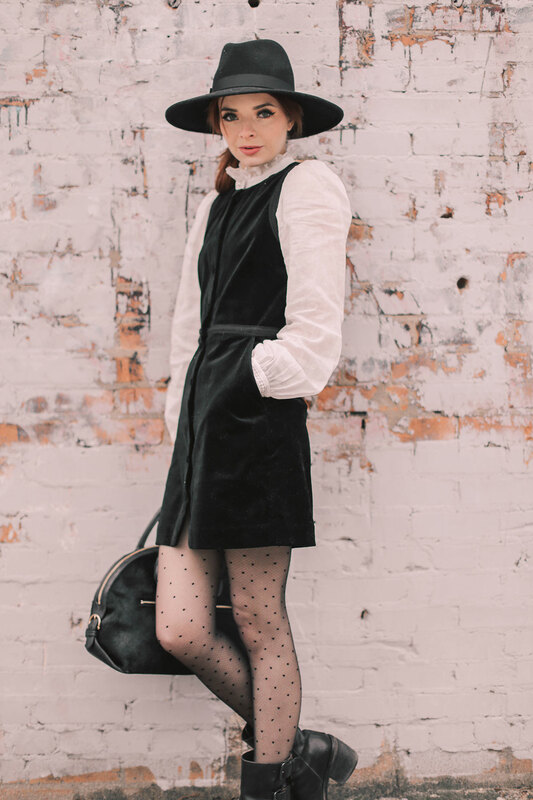 you have styled this velvet dress perfectly! Thank you! That means a lot to me. I’ll always lean towards the brighter, more fun looks but I’m really enjoying the simplicity and clean lines of menswear. Especially in the winter! 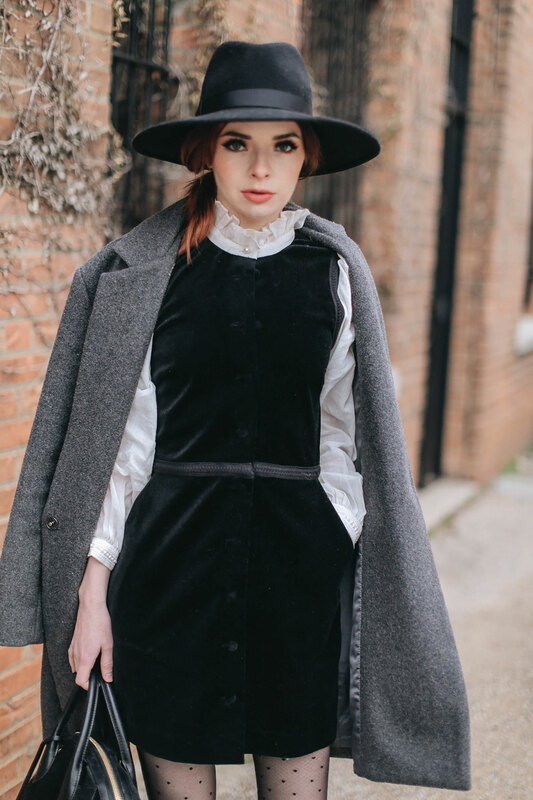 This outfit is a perfect combination of menswear and femininity. 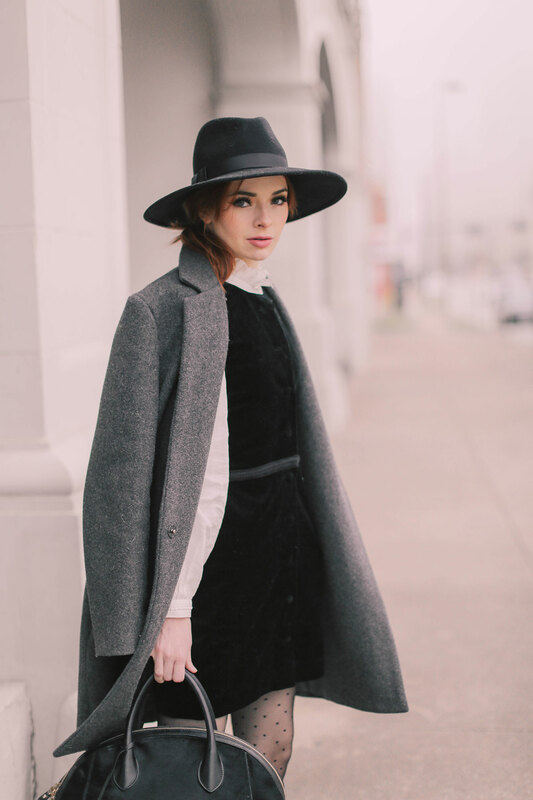 This is such an edgy and chic outfit babe, love the hat and boots! I love your crazy looks but this minimalistic one is also worth seeing!